"You slowly grow indifferent to death - I'm not scared for myself, but for my book. I still need some time." Raoul Ruiz' Time Regained (Le Temps retrouvé)adapts Marcel Proust's multi-volume Remembrance of Things Past to cinematic form, framed by Proust's own ruminations on the nature of writing, society and life. The film begins on the author's deathbed in 1922, and as Proust (Marcello Mazzarella) reminisces about his life, his memories and his literary creations begin to intermingle. Time shifts and warps as reality and art mix, until it's not clear where one ends and the other begins in Proust's imagination and re-imagination as he examines his own social observations and philosophy. Time Regained is one of those films that frustrates and perplexes my critic's soul—it's a spectacular achievement in many ways, but it lands on the screen with muted impact. Director/co-writer Ruiz achieves something long considered impossible: the adaptation of Marcel Proust's surreal social comedy to the visual medium of film with its unique style intact (see the 1984 movie Swann in Love as a counterexample). Ruiz uses a wide variety of in-camera effects, many borrowed from vintage film and stagecraft—double-exposures, scrims, stop-camera substitutions and simple lighting techniques achieve exactly the right feeling for this period-spanning work, without relying on slick CG or blue-screen technology. Framing and cinematography are consistently innovative, and the visuals evoke a dreamlike world, anchored in its time period but open to interpretation; the film cannot be faulted on this basis. Nor is the film's stellar cast to blame—Catherine Deneuve, John Malkovich, Emmanuelle Béart, Vincent Perez, Pascal Greggory and many others contribute delicately constructed performances to the work. Characterizations are complex and subtle, and it's clear that the performers have mastered the tone and background of the material, creating an ensemble feel that's never at odds with Ruiz's directorial or visual approach. Malkovich manages convincing French delivery to my admittedly unschooled American ears, but an unfortunate French actress charged with portraying an American woman speaks heavily-accented English—a minor flaw in an otherwise seamless illusion. So what's wrong with Time Regained? Ultimately, the finger must be pointed at the film's very substance. I don't deny that Marcel Proust is a major figure in world literature, largely unappreciated during his lifetime, and I have no doubt that his works will continue to deserve serious study and analysis. But the exercise of adapting his work to film seems to be just that—an exercise; the experiment is successful, but the result is not tremendously compelling. I think Proust's rich and complex world is actually more intimidating on film than on the printed page, where its substance can be savored, reviewed and absorbed at a comfortable pace. Film dictates its own speed, and the uninitiated viewer will have difficulty keeping track of the characters, some of whom are played by more than one actor, let alone the storyline. It sounds heretical to say this, but while it's a challenge to adapt Proust to the screen, the author's prestige does not automatically confer such on the film. One suspects that a similarly dense "in-movie" might be made about computer operating systems or Mattel's Liddle Kiddles, for example, equally unlikely to appeal to non-fans no matter how carefully crafted. In pop-culture terms, Time Regained is more akin to David Lynch's Dune than Bryan Sanger's X-Men—the film captures significant aspects of its inspiration but requires multiple viewings and a bit of research to comprehend fully. This is not a good thing in my book—while the film does improve with a second viewing, there are equally rich and complex films that are watchable the first time through. A noble effort and a significant filmmaking achievement by all involved, but I hesitate to recommend it to the casual viewer. Image Transfer Review: Kino presents Time Regained in its original 1.85:1 widescreen theatrical aspect ratio, with a letterboxed nonanamorphic transfer. If it weren't for the recent vintage of the film, I'd swear this was a recycled laserdisc master—the film looks soft overall, with poor shadow detail in many darker scenes, and the footage has been transferred at 30 fps with 3:2 pulldown evident. The burned-in English subtitles exhibit video "shadowing" to the right of each letter, and the non-outlined white titles frequently break up or get lost against bright backgrounds. Most scenes display good color and detail, but a 1999 film on DVD should look much better than this. Audio Transfer Review: Time Regained is presented with a Dolby Digital 2.0 French-language track, digitally misidentified as an English audio track on the DVD. The 2.0 mix is highly active and enveloping, with directional sound effects, an enveloping score, clear dialogue and competent frequency range (though low-end bass is never really called into service). I was quite impressed by the audio until the end credits rolled, indicating that the film was theatrically released in Dolby Digital and DTS formats. Why the DVD release has ham-handedly been reduced to stereo surround, only Kino knows; an unfortunate mastering shortcoming from a studio known for its devotion to quality film. Extras Review: The Time Regained DVD features almost no extras, just 24 text-menu chapter stops and the original theatrical trailer, made up of clips and critical blurbs, presented in 1.85:1 non-anamorphic letterbox taken from a slightly beat-up print. Some notes on Proust's life and work or a guide to the characters might have helped make this film more accessible; as it is, the uninitiated will remain so, and fans will learn nothing new. The English subtitles for the film are burned-in and cannot be switched off, an inconvenience for French-speaking viewers. 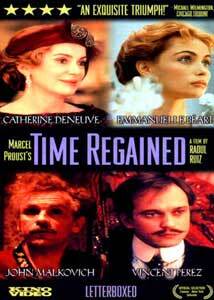 Time Regained is an exquisitely visualized but narrowly-targeted film based on the works of literary great Marcel Proust. Kino Video's DVD suffers from a sub-laserdisc quality transfer with few extras to illuminate the work or its subject. The devoutly Proustian and other patient viewers will find the film worth puzzling through, but it's an acquired taste that most viewers will find hard to swallow in a single viewing.